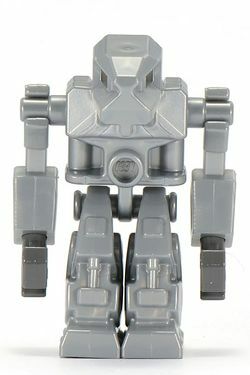 Devestators are a high-class version of the robot antagonists of the Exo-Force theme. These were the Devastators with no distinct colour, being completely silver (apart from the eyes and hands). The green version of the Devastator piloted the Sonic Phantom. One also appears piloting the 8104 Shadow Crawler. The green Devastator was designated as Special Forces. The red version of the Devastator piloted the Thunder Fury, the Raging Storm, and the Combat Crawler X2. The red Devastator specialised in heavy combat. The most intelligent class of Devastator, the blue Devastator piloted the Fire Vulture and served as gunner of the Raging Storm. The blue Devastator specialised in aerial combat. The Devastator is a more agile and intelligent robot than the Iron Drones; their lighter armour and physically weaker frames means they normally occupy the roles of officers, elite soldiers and heavy machine controllers. There are multiple variations of this type of robot, depending on the Devastator's specific role. Sly, intelligent and cold, Devastators will mercilessly bring their machines' superior firepower to bear on human battle machines, damaged units, and even civilian populations to achieve an objective. Devastators appeared in 4850307 LEGO Battles on the aliens' side as "Laser Troopers". Some appear opaque while -especially the green- others appear translucent.